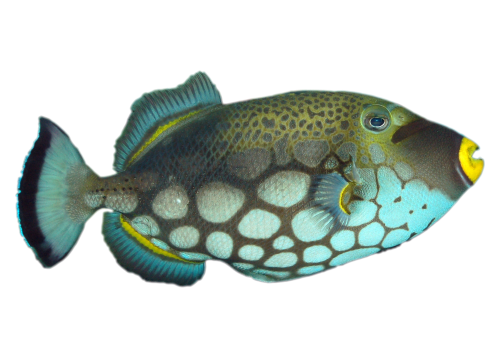 Robust, aggressive and lively triggerfish. In the aquarium often reach sizes of around 35cm, should not be bred in small tanks and with too few hiding places, otherwise it can become nervous. Requires plenty of space for swimming and possibly a run of the tank based on methods involving the use of high funds of sand (like DSB), as it loves feeding digging the ground. Omnivorous, feed on almost all foods: Cyclops, Mysis, shrimps, pieces of fish, chopped clams, brine shrimp, krill and flake food or granular food for marine fish are all suitable. In larger tanks can be kept with other marine fish of similar size, if not timid or static. Should not be raised instead with smaller fish, or in reef aquariums or, anyway, with invertebrates, since it would feed them. Because of its nature solitary and aggressive, and the fact that planktonic eggs are released, the breeding aquarium probably never happened.